Framed has been on my “To-read” list for years and I feel like doing a happy dance now that I have finally had the opportunity to read it! Nine-year-old Dylan Hughes’ family owns the Snowdonia Oasis Auto Marvel Garage in tiny Manod. As the economy has become more difficult families continue to move to London to find work and Dylan now finds himself the only boy left in town–except his baby brother Max. Although it rains almost constantly and the town is somewhat run-down Dylan can’t imagine a more beautiful, wonderful place to live. The Hughes family is close-knit and big on teamwork. Dylan idolizes his father who he declares “can fix anything.” He relates a story when he was younger and didn’t want to swim in the ocean because it was too cold; his father dumps a bucket of hot water into the ocean near him and Dylan felt warmer–despite his older sister’s ridicule of the entire event. When ‘Daft Tom’ attempts to rob the gas station Mr. Hughes calls Tom’s mother. She arrives to get Tom, then Mr. Hughes speaks with Tom about his behavior and ends up offering him a job. ‘Daft Tom’ becomes ‘Nice Tom.’ To Dylan this is further evidence that his father can fix people as well as cars and oceans. With money dwindling and the price of petrol (gasoline) and insurance for the gas station rising the Hughes family are in danger of losing their livelihood. Dylan’s mother decides to sell some possessions to make a little extra money. ‘Nice Tom’ wants to help. He is a huge fan and collector of the Teenage Mutant Ninja Turtles, he contributes some of this memorabilia and it brings in the most money. Dylan’s mother won’t allow Tom to give them the money he has earned so he buys two chickens for the Hughes family, figuring the hens can lay eggs and Dylan’s family can sell the eggs thus increasing their income. Dylan names the chickens Donatello and Michelangelo after two of the Teenage Mutant Ninja Turtles. In such a small town the arrival of several white vans filled with strange men causes quite a stir. It turns out that Quentin Lester works for the National Gallery in London and due to a flooding problem they have brought many of the most valuable paintings to the old quarry in town to keep them protected while they repair the galleries affected. When Lester stops at the Hughes’ gas station he discovers the names of the chickens. Upon finding out that Dylan named the chickens he makes the mistake of thinking that Dylan is interested in and knowledgeable about art. The misunderstandings, madcap schemes and slapstick episodes that build from this point forward are alternately side-splittingly funny and achingly tender. Gradually, because Lester thinks Dylan is almost a prodigy, some of the paintings are seen by Dylan and those nearest to him. Although Dylan has never really thought about art the paintings themselves begin to effect change in Manod. ‘Nice Tom’ sees a Melendez still life and is inspired to create his own still lifes in unexpected places throughout the town. One brings joy and a renewed sense of life to an angry miserable man who has lost more than Dylan ever realized. One brings Dylan’s own mother out of a severe depression following the disappearance of his father ‘on business.’ And Van Gogh’s Sunflowers changes all their lives in ways they could never have imagined. From the elderly sisters who live on the mountain and drive into town once a week–one blind who can drive, one sighted who cannot so she steers while the blind sister works every other part of the automobile–to Dylan’s younger sister Minnie–a criminal mastermind in the making–Dylan’s story is a rollicking ride. 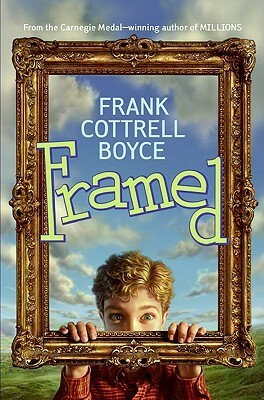 Framed is that rare book which tells an engaging story with multiple stand-out characters AND clearly shows the transformative effects of the arts. The people of Manod grow in beautiful and unexpected ways because they are exposed to the work of great artists. This is a brilliant springboard into the visual arts at home or in the classroom. Framed is a masterpiece itself. If you love a great story, a dose of humor and believe in the power of art to change both individuals and the world you NEED to run out and treat yourself to Framed!